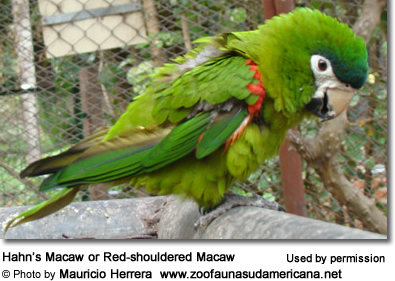 The term "mini-macaw" is derived from "miniature macaw" - which is principally used in aviculture to describe a group of smaller macaws that have a total body length of 20 inches (50 cm) or less. 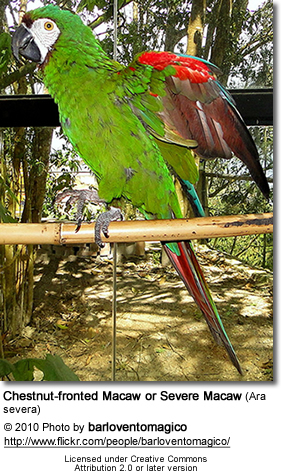 The smallest of all mini-macaws (the Hahn's Macaw) is barely larger than a cockatiel, and the larger species approximate the size of an African Grey. 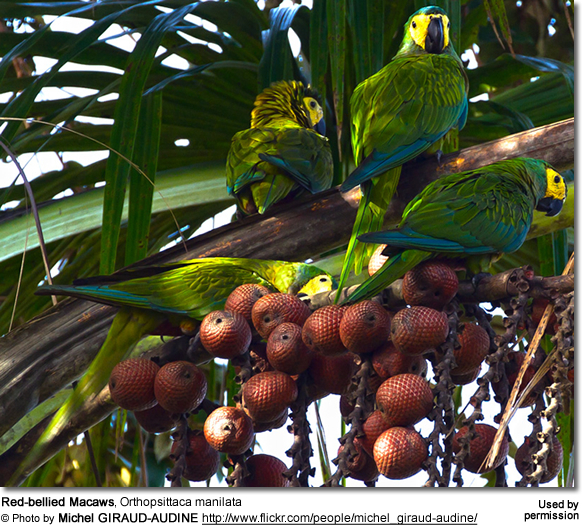 The original idea was to identify smaller macaws that require less space and can, therefore, be more easily accommodated in average-sized homes. Other than size, mini macaws share all the physical features of their larger cousins - including a long tail, bare facial skin, large and heavy bills, and a plumage that is mostly green with blue, red and yellow accents. 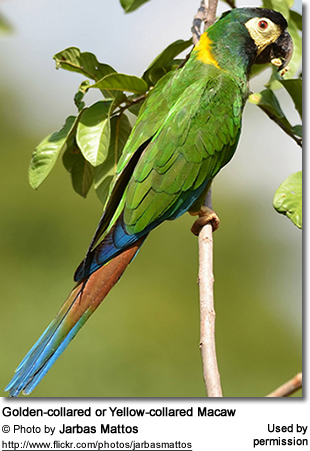 These birds are more easily trained than the larger macaws, and are more often recommended as house pets than the other macaws. However, these parrots must be well socialized as youngsters as well as being continuously handled as adults to prevent them from turning into "one person birds" or from getting aggressive towards their human handlers. 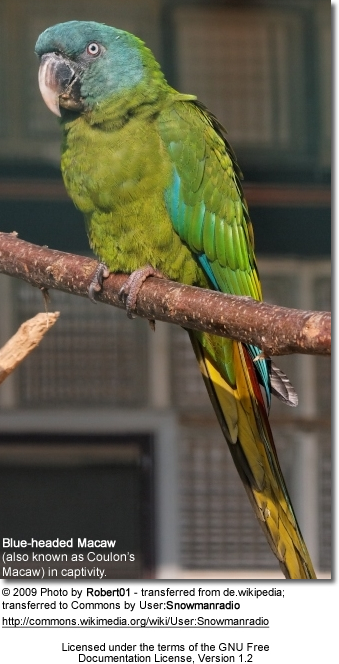 They are a playful, animated bird, but can become very noisy. They are very curious and easily excitable. They have the potential of becoming excellent talkers - which would help in diverting their vocal tendencies into words instead of noise. They can become nippy, if it is not discouraged when young. Training is important to teach them manners and acceptable behavior. Training and discipline will make the difference of this parrot becoming a beloved member of the family or a discarded problem. The largest of the Mini Macaws. Some authorities include these macaws in the group of "large macaws"; however, since their body length is 20 inches (50 cm) or less, this species meets the size requirement of mini-macaws. They are about the same size as African Greys, but have a more slender body structure. They are said to bond quickly with their new owners and respond quickly to training, but need adequate socialization to remain friendly. Measuring about 12 inches (30.5 cm) in length (only slightly larger than a cockatiel), these are the smallest of all true macaws. They are fun-loving and entertaining; but can get nippy - as is the case with any mini macaw if not sufficient attention is given to them. The Illiger's Macaw measures 16 to 17 inches (40 to 41 cm) in length. They enjoy human interaction, if raised and kept in loving, attentive homes. These intelligent birds need lots of mental stimulation. 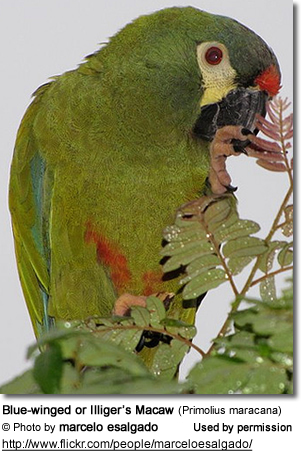 At a length of about 17 inches (38 cm - 40 cm), these are the second largest mini macaws . These affectionate, yet mischievous birds thrive on the attention from loving owners and will seek to get the attention of their human care takers by any means necessary.